Admission: $65, $55, $50, $35, $30. In 2009, Vicki and Darrell Gatwood were preparing to renovate an abandoned house in downstate Illinois. Vandals had ransacked the house, a fallen tree had torn a hole in the roof, and the structure was in generally poor condition. However, in a part of the house that was still dry, the Gatwoods discovered piles of books, personal papers, and musical manuscripts – one of which was the First Violin Concerto by Florence Price, who had died in 1953. This dilapidated house had once been her summer home and this and other works that were thought to be lost were now found. There is no record that this concerto, written in 1939, was ever performed, and in the 10 years since its discovery, it has only once been performed live--in Arkansas. Thanks to Maestro’s diligent research to obtain this rare unpublished manuscript, the Capital Philharmonic will give the East Coast Premiere of this beautiful concerto. Soloist will be Samuel Thompson. 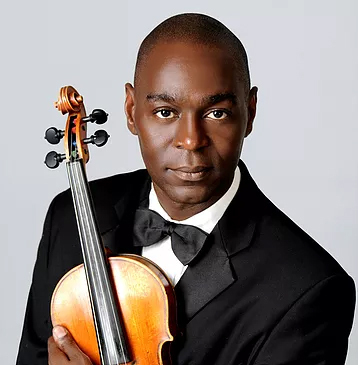 The recipient of two Artistic Assistance Awards from Alternate ROOTS and a prizewinner at the 2011 Padova International Music Competition, Samuel has appeared as soloist with orchestras throughout the United States and has performed internationally in Canada, the Bahamas, Italy, Guadeloupe and Cameroon. Surrounding the concerto is the rousing and apropos Celebration by Adolphus Hailstork and the rarely played Fourth Symphony by the “Dean of African-American Composers” William Grant Still. This is more than a concert – this will be an historic event.